Earlier this year at a peace meeting in Bristol I expressed the view that we should regard planet earth as our homeland, our race the human race, which is split into the capitalist class and the working class ( irrespective of subdivisions in each.). I went on to say that there is enough technical knowledge and raw materials for us to turn the planet into a paradise, with enough for everybody, but that first of all we must get hold of it and take it out of the control of the capitalist class, which is impoverishing and endangering us all. What worries me is that, as animals, we cannot avoid considering the fact that we all rely on territory for essential nutrition and basic resouces. If our world homeland is thought of as a vast farm, it wouldn't make sense for excessive numbers of us to be placed in just one or a few fields. Over-crowding produces all the sorts of behaviour which workers simply don't like nor want, and shouldn't have to need. In the few days within which I write this comment, it seems possible that some sort of shady deals will be rushed through to enable capitalist Turkey to join capitalist EU, thus enabling some 70 million Turks to have free access from what is mainly a land in Asia to come to Europe. No capitalist government has dared to ask workers under it if that would be acceptable. The 'pipe dreams' of the ICT, however necessary they have always seemed since its earliest and preceding organisations, will only be thought to be sensible by workers if the practicalities of implementing them in this increasingly populated world are, step by step, clarified and, if possible, planned. Hopefully we can avert and prevent an imperialist nuclear war before the 'pipe dream' is fully won, even though wars will always be generated by imperialism. Its a bit of a give-away T 34 that you see ideas about communism as "pipe dreams". You think communism is impossible? You think the working class is incapable of achieving communism? You think "communism" is a set of ready-made procedures just awaiting implementation? You fear that communism ISNT a collection of ready-made plans awaiting implementation , and it should be? However, you also think that only the arrival in reality of the "pipe dream" will prevent the next imperialist nuclear war? But why do you insist on the view that communism is really a mere fantasy, the product of fairies and political loonies dead to the world and lost in their schizoid pipe dream world where all will only be put right by "communism" a vague, undifferentiated blur of a dream with no trousers and no trousers seat available to be kicked. We can't say exactly what communism will be like in advance of escaping from this consciousness imprisoning capitalist system we're locked into now. The process of overthrowing capital will also see the start of the process of building the new society. But we go round in circles T 34 and as ET says in the article "the prospect for humanity is bleak". I feel pretty bleak too. Well Charlie, maybe 'pipe dreams' was too harsh a label, but 'impossible dream' doesn't sound to me to be too far off from the general consciousness or lack of it so far, but that is by no means the same thing as reckoning that nothing could or should be done to lift imperialism off the backs of humanity. However, it seems to me that to work and wait for an ultimate overall ICT result will be too late, in view of the build-up of nuclear and other big and small weaponry, so that urgent interim measures are already needed to avert total catastrophe. What exactly those measures are is a subject for thought and debate and action. I must dash. Cheers. Does it make sense to assume that immigrants are going to join with revolutionary organisations on arrival or soon afterwards ? I don't think so, because surely their tendency is to try to blend in as soon as possible with the status quo, whereas becoming seen as revolutionary would have the result of their being regarded as unsuitable for employment by employers. Whereas leftists demonstrate with placards saying 'refugees welcome' , in view of things like the bedroom tax, how much spare accommodation is available within working class areas ? Then there are questions as to the extent to which schools and other services can cope with the influx. For the older generation of English speaking workers, the future is more likely to be care homes rather than internationalist communism, in which staff and, from large families, many residents, will tend to prefer to speak Polish, or urdu or arabic, with curry regularly on the menu. You might get some idea of the scenario by listening for a few minutes to the BBC radio Asian Network. Subsequent generations, numbers increased by yet more immigration, are likely to find everywhere even more crowded, with many more people whose native tongue is not English. Although not long ago it seemed to me best to think of a potential global proletarian homeland, now what is going on doesn't seem welcome at all to most people and unlikely to lead to anything better. This isn't a very helpful thing to say T 34, and it certainly isn't political, but I can't help noticing that this post of yours above falls under the "stream of consciousness" heading like something by James Joyce. You're letting it all just pour out! You go from leftists with placards welcoming the refugees they secretly loathe and detest to the bedroom tax and 'care homes' as a substitute for communism with curry on the menu for Poles and Urdu speakers alike and everywhere getting overcrowded and the idea of a "proletarian homeland" fading into the distance like a weird dream - what the hell is a "proletarian homeland" anyway, it sounds like an institutionalised prison for sub-standard workers?- and then it all ends up with you regretting that hardly anyone speaks English anymore and things'll only get worse and certainly all this mess isn't gong to lead to anything better! I take it by "anything better" you mean communism though you're always telling us that nobody has any plans for this unknown condition so how can we get there anyway, and then when you yourself come up with a plan for communism it all sounds like a tarted up version of what we've already been suffering from for too long already which you describe above. So what is communism T 34? I'll be brief. It's freedom. Freedom from war, starvation, ignorance and childish competition; from wage slavery and unemployment; and from misery, generalised unhappiness and hatred. Freedom from the limitations of money. Freedom from exploitation, mental imprisonment, slavery and all the psychological deformations that accrue from these pathologies. It's the freedom to be and to create. Freedom to grow and develop. Freedom to cooperate, plan and work together with other people to build an improving and beautiful world for everyone. Freedom to engage with serious education, and to be healthy. Freedom to discover the talents, skills and intellectual abilities you never knew you had. Above all the freedom to love and to be loved and enjoy life in the company of other like-minded people similarly set free. I will attempt to reply to Charlie's onslaughts of 2016-04-06. Whether or not he regards my recent comment as not very helpful is probably so in that he doesn't like his feathers to be ruffled, especially if he really thinks that his second comment of 07:28 is anything more than an idealist panacea. I have often remarked that plans for constructing anything would be advisable and needed, but personally I have never come up with a 'plan' for communism. How can 'we', or, at any rate, you and comrades, 'get there anyway?' Where's that ? My once mentioning a 'proletarian homeland' was intended as being akin to what I just called Charlie's idealist panacea, rather than a 'prison for sub-standard workers' as he puts it, but if he reconsiders the chaotic situations which might be briefly summarised, yes politically, in the 'care homes' outlook, he might come to realise that his major aspiration is a non-runner, at least in the UK and probably further afield. That is not to say that there won't be any turmoil deemed to be proletarian revolution, but such events so far have not led to anything like what he wants, though now he will probably chant that that 'communism' wasn't 'real' communism. So it could get better, or even worse; in plain English ! Your subjective vision of the world seems to be taken from the Daily Mail. As I have already told you you can identify with the working class (which includes migrants) or you can identify with the divisions the capitalist class plays on to keep those who have in common the fact that they labour for a wage from uniting and fighting for a better futre. 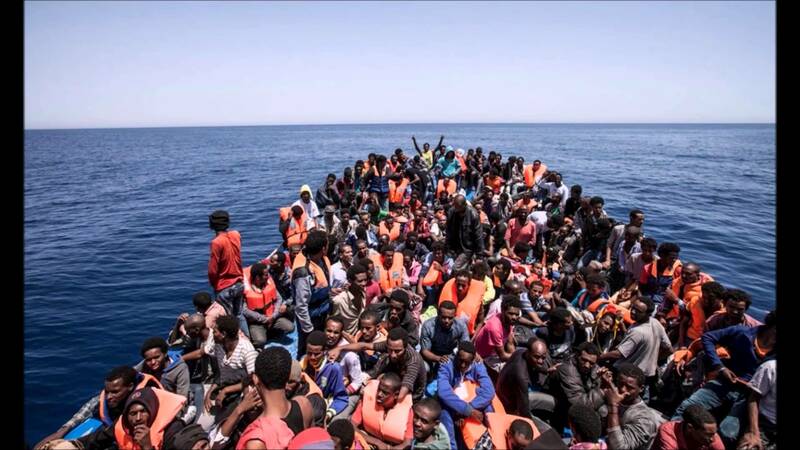 There is no "migrant crisis" (Europe is being asked to take 0.2% of its current population at the moment) but there is a capitalist crisis and in this crisis fear is one weapon the capitalist deploy to make one group resent another for fear of losing out. You seem to be adding to that chorus. Replying to comment of 6 April 2016, no, I don't just have to choose between identifying with the working class (including immigrants) and what the capitalist class does, and apparently only thus identify with CWO ICT doctrine on all that, and now don't want to anyway. You are perpetually dismissive of any issues which you fear threatens the imagined permanent stability of your views. It seems to me that the extremist extent of your views is enough to put workers off multiethnic multicultural socialism and moneyless communism, rather than persuade us towards it. As for mutual personal experiences of care homes, my mother spent a long time in one in Bolton and my aunt one in Cheltenham. She could sit in a large room in and around which were many chairs. She had meals in a large dining room. Staff from various international backgrounds were very helpful to her and other residents. My point was intended to explain that as immigrants whose native language(s) are not English increasingly arrive and then settle for what you describe as measly pay, it seems likely that if and when my own elderly and other generations find themselves sitting around a care home lounge, many residents by then are likely to want to chatter in something other than English. Would you be happy enough with that ? Incidentally, today I had to return to the Library a teach yourself Urdu course, as the tape in one of its two cassettes was missing. In the newsagent I go to, blokes at the counter chatter in Urdu with each other and with some customers. Hi T 34. Sometimes you sound like David Cameron. If people who end up in fancy care homes with meals provided in spacious dining rooms and very helpful staff even if "foreign" don't have anything to complain about other than the inability of the staff to amuse them by not being able to chatter in English, then they haven't done too badly considering what happens to the majority of us. Most old people don't end up in such "cosy" circumstances but are left to struggle on alone with increasing difficulties and loneliness as best they can. I am curious about your passion for Urdu. Are you intending to use that language to convert arrivals from the Indian sub-continent to your own brand of capitalist politics? Charlie, the care homes I know of are not 'fancy', as you put it. Cosy? Well, they provide heat, something that many pensioners cannot adequately afford in their own homes. The homes owned by elderly people who urgently need to move to a care home have, in some cases, to be put on sale at short notice, and then a bridging loan has to be raised to pay a deposit while an estate agent seeks a buyer. The physical efforts and costs involved in clearing the home for sale can be demanding of close relatives. The state money contribution to the care home costs is, in my experience, far short of the fees, which increase as the amount of care necessarily unfortunately grows. I do not have data regarding elderly workers needing care home care who do not a home of their own to be sold, but I expect that it is as bad as you say. In reply to your question about me and urdu, that was only a brief and passing attempt to look into the language. As for sounding like a certain politician, a sign in a railway carriage today asking passengers to keep the sound of mobile phones down made me think of something like hush hush lush. You didn't have to reply T 34 but thank you and I'm sorry I upset you. Thank you Charlie, apology accepted, and my apologies likewise, so here's to no worries - some hopes ! As a brief thought re loneliness in old age and a migration, it can be of some comfort for any retired workers to remember that they are part of a world class. Stood in my aunt's home after it had been cleared of everything but the phone, I remembered being in it when it belonged to my grandad. He had been sent to Archangel at the end of WW1 as a morse code telegraphist. He was back in 1919. Gran, a telegraphist, went stone deaf from scarlet fever, so Gramp would tap messages on his knee which she could read across a room of other people, and they didn't know what he had sent ! Yes T 34 we are part of a World Class. And we mustn't forget that the suffering capitalism imposes effects the whole world not just Northern Europe. I have some experience of life in S.East Asia where the poverty far exceeds anything to be found in Europe. A lot of people live in appalling conditions in this area, almost reduced to scavenging to stay alive, or even selling their own bodily organs as happens in the Philippines in an albeit temporary effort to alleviate some unbearable situation at home they feel duty bound to respond to. If it wasn't for the freely available warm weather in these areas, people here would be quickly decimated in their millions. But as it is the sun and ample doses of religion and superstition somehow work to maintain capital's cruel dictatorship apparently unchallenged. . But what might happen here should the European proletariat suddenly wake up and start to give a lead... well, maybe one day we'll find out! But it won't be very nice. Charlie, what you've just said on 9/4 10.06 is noteworthy and the outlook needs a lot of considertion. Whilst appreciating being part of the world proletariat, it can also be encouraging to know, for instance, that in my case I'm also English, and it is not a case of just having to choose betwen one or the other, though still recognising competing inter-class interests in the UK and worldwide. Charlie, further to your outlook, it then seems that a worldwide class war would be cast as a worldwide race war, with the Maoist led yellow and brown peril rising up against the white supremacist imperialist colonialists. In that case, it wouldn't be as important to choose a side as to realise, as in WW2, which side most local people would think you're on, of which the answer is shown in a bathroom mirror. If that does turn out to happen, then, if Europeans hope to survive, they will need to close ranks, and thus borders, but that might be too late already. Not very nice. Your latest reply T 34 horrifies me! Why would a world wide class war be cast as (do you mean become?) a world wide race war? Why do you call all folk indigenous to the Far East, as it used to be called, a "Maoist led yellow and brown peril"? Striking workers in China might find that a bit of a joke. Mao is somewhat old hat now and "yellow and brown peril" goes back surely to the early 20th century, Rudyard Kipling and Boys Own Comics? But I'm a little miffed that somehow you try to credit the world wide class war which inevitably in your view turns into a world wide race war as my "outlook"! This is a very good reason for requiring the international presence of a World Communist Party with powerful communicative techniques able constantly to clarify and explain what is happening and developing inside and within proletarian uprisings as these take place and develop. Fortunately information networks are far more developed now and available to all just about everywhere in a way in which they weren't even 20 years ago, never mind the 'sixties. So that is a positive for us. Whether it's a positive for you T 34 I am no longer sure. You sound increasingly like some left-over little Englander from what I thought was a bygone age. And if you are gong to respond to this latest post of mine with another little Englander type response from you then expect no reply from me. Charlie, you say that "Mao is somewhat old hat now". Presumably Marx, Lenin and the founders of the communist left in Italy are exempt ?! In Latin America there has been and maybe still is some support for Maoist theory and activity. In the USA at least one organisation promotes it. That is not saying that I'm advocating it, but just trying to point it out to you. You always seem eager to tack labels ad/or allegations onto me, dismissing much of what I've said. You think that (quote) "There is a very good reason for requiring the international presence of a World Communist Party.." etc. Have you been aware of the communist left one, the International-Communst-Party, based in Liverpool ? You seem to be impatient that the ICT just keeps saying that it is not yet, though seeks, the WCP that you see presumably as required now.